When the masterminds behind Vij’s and Rangoli, Vikram Vij and Meeru Dhalwala, decided to add a food truck to their commercial endeavours, I was super excited to try it out. I’m not sure what happened, but 12 plus months later, I finally managed to trek out to Vij’s Railway Express and now have regrets of not going sooner. On my first visit, I ordered the halibut cheeks cooked in coconut masala curry served with rice and naan. 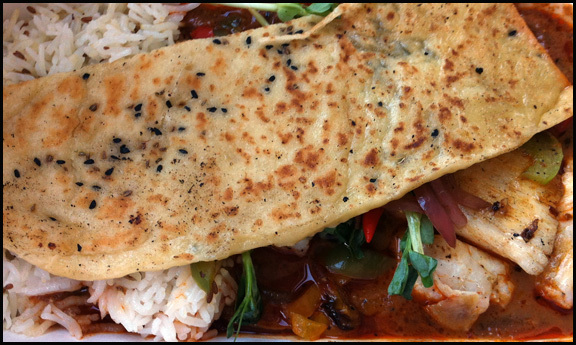 With the weighty take-out box in hand, the delicious aroma emanating from the curry quickened my pace back to the office. Once seated, I lifted the lid to see what created such an appetizing fragrance and found a curry filled with pieces of halibut, chunks of tomatoes, slices of bell peppers and onion. This savoury mixture was topped with pea shoots, which in addition to being a garnish, did provide its own flavor to the meal. I didn’t expect perfectly cooked fish in the curry. The halibut was indeed a little chewy but it was still moist and had a pleasant sweet taste. 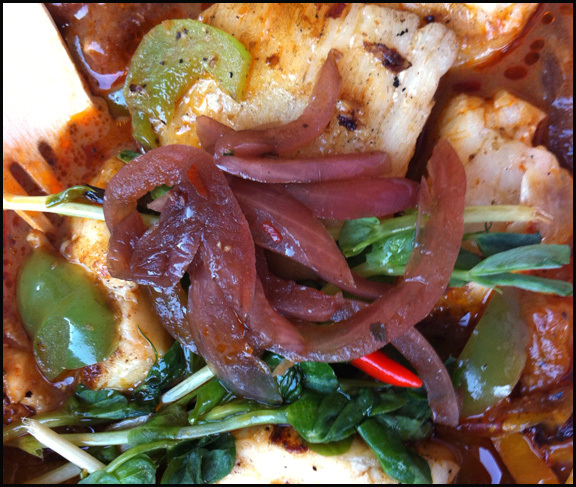 The juices that escaped the fish mingled nicely with the curry, creating a complex flavor. The sauce had an initial hint of sweetness, then a savoury/umami middle and slight spicy finish. The curry was wonderful to eat with the well prepared basmati rice and naan. The enticing scent of the halibut cheek curry had an impact on my coworkers. Upon announcing that I was heading back to Vij’s food truck a few days later, my colleagues asked if I could grab a few items and do a potluck lunch. I wasn’t going to turn down an opportunity to try more food. 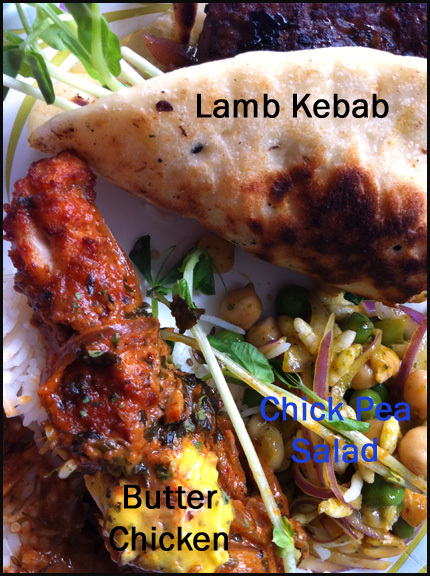 I returned to the office with the Lamb Kebab, Butter Chicken and a Chick Pea Salad. The lamb kabab was wrapped in a fluffy naan along with red onions, pea shoots and a tart chutney. In order to share it, we deconstructed the wrapped. Within the first bite of the kebab I knew my coworkers would have the pleasure of finishing off this entrée as it was too spicy for me. 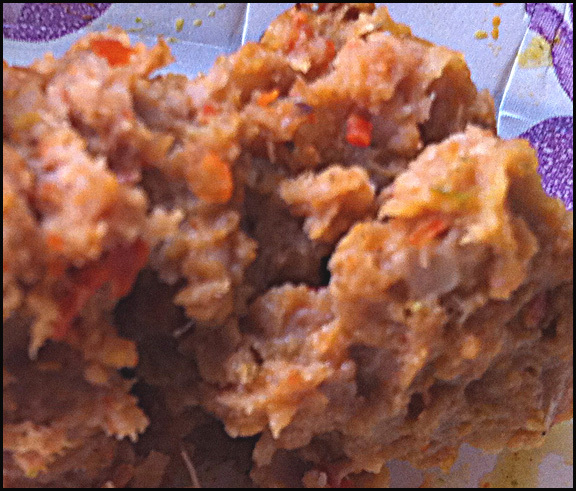 I saw a bountiful assortment of chili flakes and seeds in the kebab mixture among other seasonings like parsley. In the 3 small bites I managed to eat, I discerned that the meat was moist, exhibited lamb and cumin flavors and lastly had a very spicy kick. Since my colleagues were spicy food lovers, they liked the lamb kebab a lot. The butter chicken was a fusion dish. The white meat chicken was panko breaded and then deep fried like a schnitzel. I found the chicken slightly dry and under seasoned. The sauce with pieces of onions, was more tomato based and as a result felt light. However in comparison to the halibut curry, the butter chicken sauce was not as complex tasting. It just had a predominant sweet flavour. I think I prefer a more traditional butter chicken than this edition. My sincere apologizes for the absence of photos for the salad which was pretty to look at. Unfortunately, I developed a case of shaky hand syndrome when I took close-ups of the chick pea salad and every photo I shot was too blurry to use. Of course I discover this after we finished the chick pea salad. The salad included chick peas, fresh peas, peanuts, puffed rice, onions and a mango chutney that served as a dressing. The only miss of the ensemble was the puffed rice. I think in addition to the red onions, the rice was included to provide crispiness to the salad but the mango dressing and my 10 minute walk back to the office turned them into soggy puffs. Despite this one issue, the chick pea salad was my favourite out of the 3 items I purchased. The round legumes in the salad provided differing tastes and textures, while make the salad a hearty and substantial meal. However I thought the mango chutney was the star as it brought a burst of contrasting sweet and sour flavors to the combination. The fruity dressing was able to make the legume salad refreshing and dynamic. 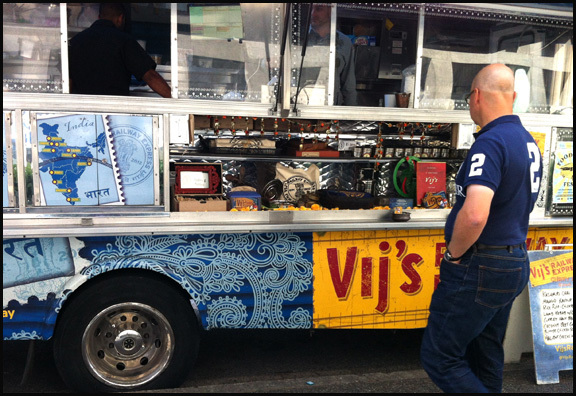 Although I still think my favourite Indian meals have come and will probably continue to come from my friend’s kitchen, I did enjoy my lunches at Vij’s food truck very much. Since I can’t always be guaranteed an invitation to Indian home cooking when I have a craving for it, I think Vij’s Railway Express will be an affordable and tasty alternative for me.